Love your signature,Bob! "Let that be a lesson to you, Fred: Never trust an Oyster!" The irony is you'd have to be a pretty old hand to be able to quote Super Chicken! And if the women in your life are still women in your life after quoting Super Chicken then I wouldn't pay them much heed--seems they're not going anywhere anyway! Used to have the theme song on my old cell phone. Now that would get you some odd looks! has anyone here thought of what they want the campaign ribbon to be? I'd be fine with either mine or Bob's design if nobody else chimes in with any ideas. I have also decided to take part in the campaign, always wanted to build a Japanese tank. I have a suggestion ribbons can you enjoy chrysanthemum is the symbol of the imperial family. Notice that your signature says you are going to be doing a LAV for this campaign. You using the kit markings? Very cool choice, Bob! What exactly is this vehicle? And where are you doing the custom decals? So these LAVs are typically seen as Ground Self-Defense Force vehicles, but the Air Self-Defense Force has some also. My plan is to model mine after one of the JASDF LAVs we have here on base. I'll be using white inkjet-printable decal sheet to create my own markings. I may have an opportunity in the next couple of weeks to get downtown and I can look around for some aftermarket decals for the unit you are after if you would like. I also plan to do a photo walk-around of one of the vehicles on base which I can post as a photo feature if that would be helpful to you. Won't do you much good WRT the markings, but hopefully get some good shots for kicking up the detail a notch. It's actually from a JASDF vehicle marking. 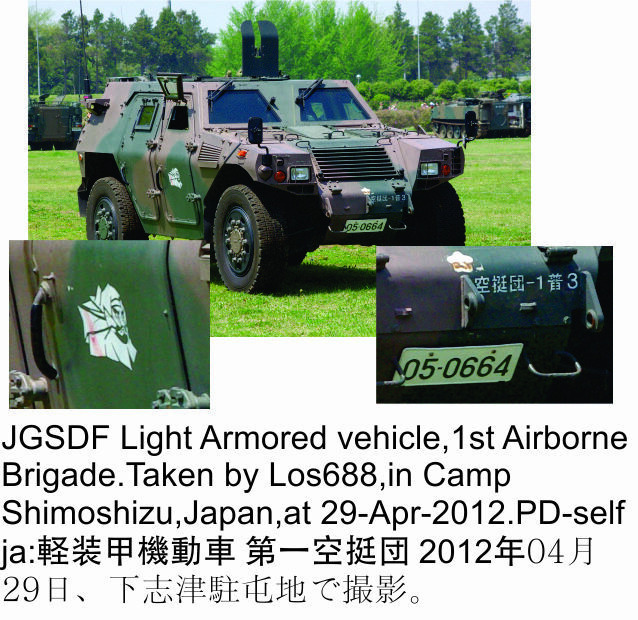 The vehicle is a JGSDF LAV (Light Armored Vehicle) and the kit I will be using is the Tamiya one. The kit markings are for a vehicle in Iraq but I will be doing one based in Japan. As for the decals, I am making the images by tracing the unit insignia and the Kanji unit designation text in Corel Draw. That will be sent to a company that makes model railroad couplings as well as doing custom decals. The issue is that the decals have to be in white and there are only limited printers that will actually print white, most printers just use the paper color (typically white) for any white in the image. If you can find the decals it would save me a ton of work. However, I doubt if you will find any. I have the figure on the door pretty much done, and the Kanji is finished (in Corel anyway). I need to scale them to fit the locations as well as do the sheet layout. Thanks for the details, Bob! After reading your answer, I just realized the white in the text and insignia is what makes this complicated. Am facing the same challenge coming up with my decals, and got a suggestion from the Armorama community awhile ago that sounds like a winner. Create a paint chip/sample of the base color you intend to use on your vehicle, and then scan that to use as the base color for your decal. Make a negative image of your markings using your scanned color sample as the fill, and when you print it on a white decal sheet you should (with a bit of trial and error color adjustment) come up with the desired markings outlined in the same color as your vehicle. Does the way I've attempted to explain it make sense? Might be a bit of a challenge on a vehicle with camo, but since the JASDF LAVs are a uniform green it will make it much simpler. I had considered going that way with it, and I might give it a try anyway. My issue is that I don't figure that I will be getting it down to the right color. Saw your thread on the "other" site. Glad you've got some real expert advice there. I figure getting a perfect match will be a bit dicey, but I always overspray the entire vehicle after applying decals with a slightly lighter shade of the base color. Helps tone things down and blend the decals in with the rest of the paint job, and in this case should help disguise and slight color mismatch. I've noticed the LAVs we have here quickly acquire a pretty substantial coat of oxidized paint that looks almost white so I think that will help with the decal dilemma. Nice pics. Looks like they were taken at Iruma AB and Hamamatsu AB, and they've been given a good scrub, too. I plan to get up close with the camera to try to capture as many details as I can since there are some significant differences from the Iraqi Assistance version I have. As far as I can tell from the captions you hit it on the head as to the bases. Hopefully you will have a chance to really get up and personal with one of the LAVs. I know what you mean about the differences.... even within a unit there are antennas in different places, racks missing, etc. along with all sorts of other changes. I figure that for the most part you can almost do anything and get by with it. I have a bunch of shots of the Airborne ones and there is a lot of variation. No PE, although I may go for some resin wheels. Plan on scratching anything I'm not satisfied with. I figured on using very fine soldered wire for the brush guards. I'll be looking to join this campaign when Takom releases its Japanese Whippet kit. crap cakes, I have to step away from the cleaners. Removed by original poster on 06/14/15 - 18:49:38 (GMT).